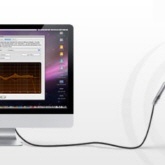 To perform a measurement of Acoustic Power you will need a PC or MAC with CONEQ software installed, a measurement microphone and an (external) soundcard connected to your PC or MAC. As a rule of thumb all measurement-grade microphones and most of the soundcards available are fully acceptable for CONEQ. CONEQ WORKSHOP software runs the test signal, a characteristic swept-sine wave. This signal is fed into the speaker (or channel of speakers) under measurement and is played back by it. Start the measurement and move the measurement microphone through the coverage plain of the loudspeaker with an even speed e.g. from the top to bottom and from left to right. In a typical case the whole measurement process should not take less than one and not more that 2,5 minutes. The measurement is recorded and stored into the software as a *.wav file. After the measurement process is completed, the CONEQ software calculates the true Acoustic Power Frequency Response of the loudspeaker and the correction filter, directly inverted to the response measured. The information is shown in form of a graph that could also be used for evaluating loudspeaker installations quickly and accurately. If the application requires it, e.g. 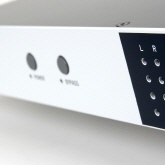 if a non linear reproduction of sound is favoured, parameters for calculating the APFR and the correction filter can be customized by the user, based on the measurement taken. 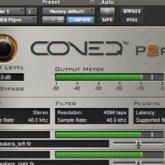 The correction filter can be uploaded into one of the APEQ professional-grade signal processors, or into any of the software CONEQpro realisation tools provided.